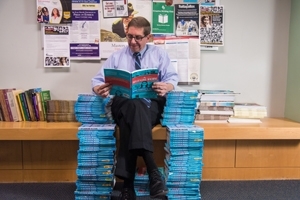 Professor John Hyman reads on a throne of books. To set the stage for their studies at American, all first-year students are asked to read a community text for our Writer as Witness Program. Students then have the opportunity to hear the author speak and take their questions at a colloquium early in the term. In Fall 2014, students heard Brooke Gladstone describe what she learned in writing The Influencing Machine, her incisive analysis of mediated information. In all College Writing classes, students discussed the book and considered Gladstone's arguments. The College Writing Program, further, sponsored an essay contest in the Fall to recognize student work inspired by the text. In most academic years, the story of the Writer as Witness Program ends there: Students complete their classes and they put the book on a shelf. This year, however, we are delighted to report that the story continues long after the fall semester and far beyond our campus. Since leaving the D.C. area, I've stayed connected to several of my colleagues in the Literature Department, and I follow news of the College Writing Program. I was following news of this year's Writers as Witness text with much interest and a tad of envy. I couldn't help but dream about the lessons and activities that would be possible with such a versatile and relevant text. I knew my high school students would be invigorated and engaged with a book like The Influencing Machine. And that's when I had this idea: What if AU freshmen were asked to donate their copy of their Writer as Witness text after they were finished using it? So we asked our students. And hundreds of them donated their books, insuring that the books would have a second life in the hands of students in Jennifer's school. For the first time, Jennifer reports, she can offer some fresh choices of reading for her students - not to mention the fact that she can provide whole class sets of books to her crowded classrooms. Jennifer explains: "This partnership is just the latest affirmation of many positive experiences I've had since joining the AU family in 2008. The entire Long Beach community thanks you, AU."